Want your work tasks to be simpler and faster? The answer for most of us is, yes! Food manufacturers want to move food from the plant to the shelf as quickly as possible. When testing for pathogens, getting an answer quickly can help get your products to the shelf faster. Culture-based tests or rapid methods are the two most common testing methods. Culture-based tests, the historic gold standard in testing, look for growth of pathogens in a specific media. However, they are labor intensive and require from three days to a week for results. In contrast, rapid methods have evolved in recent years, and results are now typically available by the next day. Raj Rajagopal, Ph.D., is a senior global technical service expert in 3M’s Food Safety Lab. He explains that two types of rapid pathogen detection exist – either immuno-based assays or DNA-based assays. DNA-based rapid-method tests are generally considered to be the most accurate. 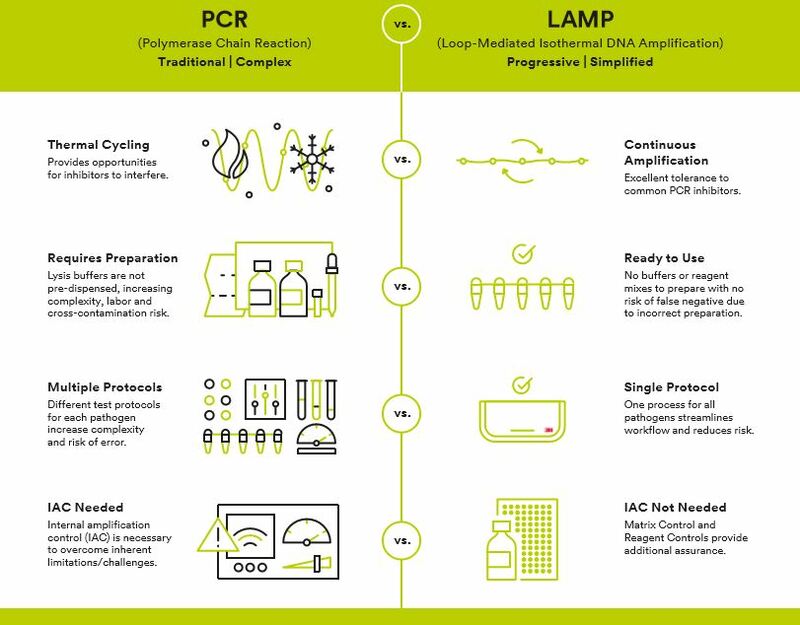 DNA-based methods: How does PCR differ from LAMP? Among the several kinds of DNA-based rapid methods, polymerase chain reaction (PCR) has been used for pathogen detection for more than 30 years. It can detect foodborne pathogens like Salmonella, Listeria, Listeria monocytogenes and Cronobacter. PCR uses heating and cooling cycles to cause DNA melting and replication. Here’s how PCR works: The process uses heat to separate the two strands of DNA, and then temperatures are cooled, and primers bind to the DNA. Repeated cycles of heating and cooling, along with the addition of primers at each stage, amplify DNA for detection of pathogens. In contrast, loop-mediated isothermal amplification (LAMP) is a technology that also uses DNA-based testing. LAMP technology is used in the 3M™ Molecular Detection System, which combines isothermal DNA amplification and bioluminescence detection. 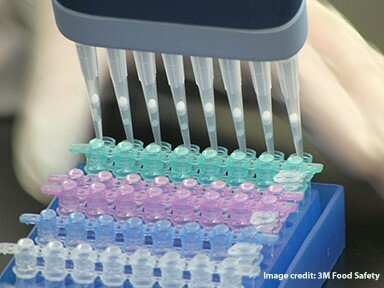 Using methods similar to PCR, the technician immerses the sample into primers that search for the DNA of Salmonella, Campylobacter or other specific pathogens. If the DNA is present in the sample, the primer makes copies and amplifies that DNA. By amplifying the target DNA, it creates a large enough signal – in the form of light – so that the instrument can detect it. However, LAMP differs from PCR in several ways. It uses four to six primers to recognize six distinct regions of DNA or RNA, while PCR uses two primers to recognize two regions. The primers in LAMP cause DNA strand displacement and causes the end of the DNA strand to form a loop. This structure is the basis for amplification and allows for the exponential accumulation of additional double-stranded DNA. PCR testing requires numerous cycles of heating and cooling to amplify the target – and that calls for more complex equipment. LAMP uses isothermal amplification, meaning it only needs to be heated up to one temperature – 60 to 65 degrees Celsius. That means fewer steps for the technician and smaller, simpler equipment. LAMP also uses bioluminescence to detect the pathogen, so the equipment can detect amplification of the target during the reaction in as little as 15 minutes. LAMP technology is creating a buzz in the research community, and more than 8,000 peer-reviewed publications about the topic have been published since it was introduced. The United States Department of Agriculture (USDA) has taken notice, too. They chose the 3M Molecular Detection System, which uses LAMP, as a primary method the Food Safety and Inspection Service (FSIS) will use in testing for Salmonella and Listeria monocytogenes – two serious pathogens that put food at risk during production and processing. In addition to USDA FSIS, 3M Food Safety works with AOAC International to validate methods and reaffirm test kits have a consistently high level of performance. Methods have been tested and certified by the AOAC so that food manufacturers have an assurance that the tests have been approved by an unbiased agent. He adds that there are indicators to show when it is heated it turns to yellow, and when it cools, it goes back to pink, so you know that is has reached the correct temperature. To see the 3M Molecular Detection system in action, view this 3M Molecular Detection instructional video. Learn more about the importance of environmental monitoring and the steps you can take to be more proactive about food safety in your facility. Download the full handbook by visiting 3M Environmental Monitoring. Need more information on the total 3M Food Safety testing solution? Simply reach out and we’ll be happy to help you with any questions you have.